Pythons slithering into homes in Sattahip have become so common that locals simply now only pay attention so they can bet the victimized house’s street number in the lottery. 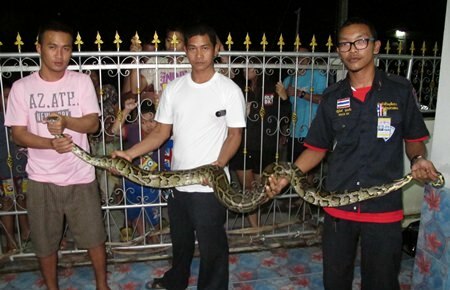 There was another rash of ticket sales Oct. 31 when a three-meter snake was found at the back wall of Ngan Nookajad’s yard in Khoa Pech. No one was hurt and animal rescuers well-practiced with the steel lasso transplanted the reptile into the jungle. Animal rescue rescuers managed to lasso the snake and move it back into the jungle. Residents said the snake crawled from under an old spirit house into the bungalow two days in a row. While it certainly inconvenienced 52-year-old Ngan, others took it as a sign of providence and promptly played the house numbers in the government lottery.